To all young people out there: This is the time you should be fearless but not jobless. Identify the right job, look for what excites you the most, find what you are the most passionate about. Desiring to engage more creatively in her professional life and connecting with people from different communities, Suhasini believes that creativity involves breaking out of defined patterns and mustering the courage to let go of certainties. She has always been an explorer throughout her life. 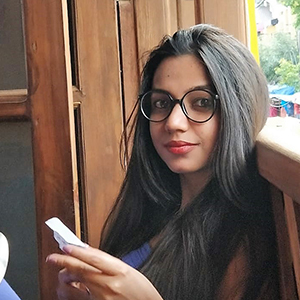 Born and brought up in Jammu, India, Suhasini holds a Bachelor’s and Master’s Degree in Computer Science from Dayalbagh University in Agra, India. For the last 3 years, she has worked as an IT consultant at Data Resolve Technologies and Infoedge India, developing her technical and soft skills mainly focusing on people management. After living in Delhi for a few years, she started searching for part-time volunteering engagements, which led her to join Coloring Lives, where she has been an active member in building education platforms for street children. This experience transformed her perspective towards life and gave her experience in social innovation. Suhasini is passionate about traveling and has been a solo traveler / backpacker for quite a while now. She enjoys hiking and spending time in the mountains. Art and connecting with people has always been her first love. During her time at Amani she is looking forward to learning how to develop and nurture her people skills required to be a social entrepreneur and bring a revolution in the area of social adoption.